TOFU MOM . . . and gravy! 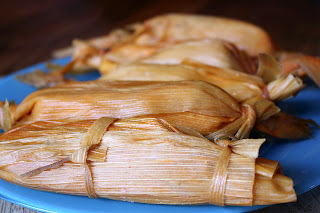 : VEGAN TAMALES to Rock Your World!! VEGAN TAMALES to Rock Your World!! Tis' the Season and all of that - the Season for tamales anyway. I'm a bad (but very busy) blogger, hopefully this family Holiday favorite of ours will hold you over. I love tamales because they're CHEAP CHEAP! A bag of masa lasts our family forever, you can fill them with WHATEVER, and I even save corn husks from the summer to make them!! I guess they're very traditional in New Mexico and other parts of the Southwest at Christmas. We like them pretty much whenever the mood strikes (and I have many hands to help!!). My fabulous friend Shaun, who lives and breathes New Mexico dust, taught me to make these and they've been a hit ever since. Yes, they are a bit time-consuming, but even my 10-year-old does a fine job rolling them - not difficult, I promise! Be sure to spice the filling to your preference or even a bit extra, it mellows a lot as the tamales steam. -- Mix beans, potatoes and seasonings. Set aside. -- Coarsely chop and then crumble ('shred') chicken product (easier to get the right texture with your hands) and mix with green chiles and cheese until sticky. -- Saute veggies in a non-stick pan until tender-crisp. Season. Set aside. Drain right before using. You can use any veggies you want; Chopped, fresh cilantro is SO GOOD here too. -- Mix sauce and "chicken together and "shred" a bit, add chick-peas and green olives. This mixture is crumbly and messier to put in the tamales, but it's SO VERY tasty!! Put the cornhusks in a sink of warm water, gently separate and remove debris, silks, and any dirt. Leave to soak for 30 min. In a deep bowl, combine the masa, baking powder, seasoning and salt. Pour the broth into the masa a little at a time, working it in with your fingers. In a small bowl, beat the margarine/coconut oil until soft and sorta "fluffy" (depending on how warm it is in your kitchen, this may not work too well). Add it to the masa and beat until the dough has a spongy texture about like mashed potatoes (but stickier). Stand the tamales up in a large steamer or colander with the pinched end up. Load the steamer into a large pot filled with 2-inches of water. The water should not touch the tamales. Lay a damp cloth over the tamales and cover with lid. Keep the water at a low boil, checking periodically to make sure the water doesn't boil away. Steam the tamales for 1 to 1 1/2 hours. The tamales are done when the inside pulls away from the husk. The tamal should be soft, but firm and not sticky or mushy. To serve, unfold the husk and eat as is, or spoon sauce of your choice (red or green chile sauce like a good New Mexican would be perfect here, but use what you want) over them. I love tamales so I believe when you say they will rock my world. Thank you for this recipe, can't wait to give it a try. You read my mind! or you heard me whining this morning because I didn't make any tamales this year. LOL. Hubby will be leaving the day after Christmas and that means I can make tamales to my lil heart's content. I can't wait to try the black bean & sweet potato....and the green chile tamales...oh and the veggie tamales...and did I miss one? I love making several different kinds. Thanks for the recipes and for giving me something to do and keep me out of trouble. Ooo, I love it! Great post! There's a really good tamale recipe in Veganomicon, too. I love tamales so much and they freeze so well that I usually make a zillion and keep them forever (they do take a while to roll up). Sounds really good. Thanks for sharing. I plan on trying the black bean and sweet potato one. I made some, inspired by this post! They were so perfect for Christmas dinner. Your blog is just so full of good ideas!